5.3 Earthquake hits off the east coast of Honshu, Japan. In the Atlantic Ocean: Tropical Depression Six is located about 65 mi…105 km WSW of Tampa Florida and about 65 mi…110 km WNW of Sarasota Florida with maximum sustained winds…35 mph…55 km/h. Present movement…E or 90 degrees at 8 mph…13 km/h. In the Eastern Pacific: Tropical Storm Irwin is located about 1085 mi…1750 km W of the southern tip of Baja California with maximum sustained winds…60 mph…95 km/h. Present movement…NNW or 335 degrees at 13 mph…20 km/h. Post-Tropical Storm Hilary is located about 1185 mi…1905 km WNW of the southern tip of Baja California with maximum sustained winds…35 mph…55 km/h. Present movement…WNW or 300 degrees at 14 mph…22 km/h. In the Western Pacific: Super Typhoon 07w (Noru), located approximately 141 nm southwest of Iwo To, is tracking westward at 07 knots. Tropical storm 11w (Nesat), located approximately 128 nm west-northwest of Taipei, Taiwan, is tracking northwestward at 11 knots. Tropical depression 12w (Haitang), located approximately 130 nm west-northwest of Taipei, Taiwan, is tracking northwestward at 15 knots. India Floods Update – Severe monsoon flooding has now killed 213 people in western India, an official said Sunday, as rescuers continue to sift through villages devastated by torrential rains. The death toll in Gujarat state jumped from Wednesday’s total of 123 as waters recede from low-lying areas, allowing workers to reach remote spots where bodies are starting to appear. Rescue workers have moved close to 130,000 people from low-lying, dangerous areas as helicopters and boats try to reach those still stranded. In Assam at least 77 people have been killed and a state-wide emergency relief operation has been underway since April. Tens of thousands of acres of crops have been destroyed. The flood toll in Odisha rose to seven with the death of three more persons in Jajpur district. On the evening of June 17, residents in the Greenland village of Nuugaatsiaq felt a low rumble shake the ground. Within five minutes, a giant tsunami arrived, caused by a massive landslide in Greenland’s Karrat Fjord. The wave washed away 11 homes, leaving four people in the town of 84 residents presumed dead. But because the tsunami struck in a remote location, researchers didn’t know how exactly it had originated and how big it had been. That’s crucial information, since another landslide is likely to happen in coastal Greenland very soon—and even more enormous waves will be on the way around the world as climate change worsens. Tsunamis caused by landslides in bays can rise to incredible heights, travel at devastating speeds, and cause massive destruction. The biggest one ever recorded occurred in 1958 in Lituya Bay in Alaska, reaching more than 500 meters in height—almost as tall as the Sears Tower in Chicago or Canton Tower in Guangzhou. A similar, albeit smaller, tsunami is thought to have destroyed Geneva in 563 CE. In the month of July, Sri Lankan health authorities have reported more than 27,000 dengue fever cases, almost triple the number of cases reported in July 2016 (10,715) bringing the 2017 year-to-date total to 114,215, including more than 300 deaths. 5.2 Earthquake hits Lake Edward, Uganda. In the Eastern Pacific: Tropical Storm Irwin is located about 1060 mi…1700 km WSW of the southern tip of Baja California with maximum sustained winds…60 mph…95 km/h. Present movement…N or 350 degrees at 9 mph…15 km/h. Tropical Storm Hilary is located about 940 mi…1510 km W of the southern tip of Baja California with maximum sustained winds…45 mph…75 km/h. Present movement…WNW or 300 degrees at 14 mph…22 km/h. In the Western Pacific: Typhoon 07w (Noru), located approximately 91 nm south of Iwo To, is tracking south-southwestward at 04 knots. Tropical storm 12w (Haitang), located approximately 216 nm south-southwest of Taipei, Taiwan, is tracking north-northeastward at 17 knots. China – At least 10 people were killed after a flood hit China’s northwestern Shaanxi province. Heavy rains hit Yulin City in northern Shaanxi from Tuesday night and caused floods in a number of areas. Floods in China. ReutersFloods in China. More than 71,300 people were forced to evacuate, the provincial flood control headquarters said. Power supplies and telecommunications were also disrupted. Taiwan – Taiwan suffered flooding, widespread power outages and winds of over a hundred miles an hour as it was battered by its first typhoon of the year on Saturday. Much of the island came to a standstill, with most train services suspended and as many as 249,230 households without electricity as Typhoon Nesat (Gorio in the Philippines) — packing gust of up to 180 kilometers (111.8 miles) an hour — blasted across the country. The storm made landfall at 1110 GMT in the eastern Yilan county, whipping up massive waves of over 15 meters (49.2 feet). The number of cases in the Cyclospora outbreak in British Columbia and Ontario has nearly doubled since the last report two weeks ago. Since July 14, 47 additional cases were reported. A total of 104 cases have been reported in two provinces: British Columbia (6) and Ontario (98). The source of the outbreak has not been identified. Less than two weeks after issuing a health advisory, the Texas Department of State Health Services (DSHS) is reporting 145 cases of infection with the parasite, Cyclospora. Long-lasting illnesses caused by the parasite, with symptoms like watery diarrhea, loss of appetite and fatigue, have been seen in various parts of the state and have prompted public health experts to advise health care providers and the public to be aware of the symptoms and pursue testing when needed. The Ministry of Health of Somalia has reported 1068 acute watery diarrhea (AWD)/cholera cases and 3 deaths for week 28 (10 – 16 July 2017) with a case-fatality rate of 0.3%. The cumulative number of cases stands at 58,524, including 812 deaths, in 15 regions across the country. The overall case-fatality rate of 1.4% remains above the emergency threshold of 1%. However, the cholera outbreak which started in January 2017 is slowing down, thanks to timely interventions by WHO, national health authorities and health partners. In the Eastern Pacific: Tropical Storm Irwin is located about 1125 mi…1810 km WSW of the southern tip of Baja California with maximum sustained winds…60 mph…95 km/h. Present movement…NW or 305 degrees at 1 mph…2 km/h. Tropical Storm Hilary is located about 715 mi…1150 km W of the southern tip of Baja California with maximum sustained winds…65 mph…100 km/h. Present movement…NW or 305 degrees at 10 mph…17 km/h. In the Western Pacific: Typhoon 07w (Noru), located approximately 60 nm south of Chichi Jima, is tracking south-southwestward at 09 knots. Tropical storm 11w (Nesat), located approximately 342 nm southeast of Taipei, Taiwan, is tracking northwestward at 08 knots. Tropical storm 12w (Haitang), located approximately 266 nm southeast of Hong Kong, is tracking north-eastward at 05 knots. Thailand – A number of residential areas in the northeastern region were hit by flash floods Friday as a result of a tropical storm blowing from South China Sea. The flood – the worst in 40 years by some accounts – was particularly severe in the city of Sakon Nakhon, where residents found water rushing into their homes in a time span of less than a day. The local airport was also forced to shut down by Friday afternoon. Maryland, USA – Montgomery County could see some flash flooding Friday and Saturday as heavy rains hit the area, according to the National Weather Service. By Saturday, the area could get up to three or four inches of rain, he said. Similar rainfall is expected throughout the state, but Baltimore and Washington, D.C., could get five or more inches. According to the Centers for Disease Control and Prevention (CDC), eleven human infections with novel influenza A viruses were detected in Ohio during the week of July 16. 5.8 Earthquake hits the North Atlantic Ocean. 5.7 Earthquake hits Buru, Indonesia. 5.3 Earthquake hits the Izu Islands off japan. 5.2 Earthquake hits the Komandorskiye Ostrova region, Russia. The swarm of earthquakes that originate in Fagradalsfjall mountain on the Reykjanes peninsula are now on the decrease. A few earthquakes occurred yesterday morning but they’re diminishing. According to the Iceland Met Office, over 500 earthquakes have been measured in the swarm which began Wednesday morning at 7 am. Three earthquakes were clearly felt in Reykjavik, especially the one at 13:55 which measured 4.1. Geophysicist Páll Einarsson said speaking to today’s Morgunblaðið that the earthquakes are at the point where the tectonic plates meet. He said that although earthquakes in Reykjanes are common, the swarm yesterday was one of the biggest that they’ve measured in a few years. In the Eastern Pacific: Tropical Storm Irwin is located about 1120 mi…1800 km WSW of the southern tip of Baja California with maximum sustained winds…50 mph…85 km/h. Present movement…W or 270 degrees at 2 mph…4 km/h. Tropical Storm Hilary is located about 590 mi…955 km WSW of the southern tip of Baja California with maximum sustained winds…70 mph…110 km/h. Present movement…WNW or 300 degrees at 8 mph…13 km/h. In the Western Pacific: Typhoon 07w (Noru), located approximately 163 nm northeast of Chichi Jima, is tracking southwestward at 09 knots. Tropical depression 12w (Twelve), located approximately 220 nm south-southeast of Hong Kong, is tracking westward at 08 knots. Ghana – Ghana has been hit by deadly floods in the northern region. Most areas of the regional capital, Tamale got flooded after heavy rains on Tuesday flooded major areas. Local media reported two deaths and the loss of properties. Philippines – Heavy rains battered parts of the Philippines Thursday, July 27 due to southwest monsoon enhanced by a severe tropical storm. The country’s weather bureau said this year’s seventh cyclone ‘Noru,’ locally known as ‘Gorio,’ has intensified into a severe tropical storm. ‘Gorio’ is not expected to make landfall, but Batanes in northern Luzon is now placed under warning signal number one. Western Luzon has been damped with moderate to occasional heavy rains. The rest of Luzon and parts of the Visayas region have been affected as well. Many roads were impassable due to persisting floods. Floods in some parts of Quezon City are waist-deep. The weather has prompted dozens of cities and provinces to suspend classes in all levels of public and private schools. Istanbul, Turkey – At least ten people were injured – two of them seriously – when a violent thunderstorm struck Istanbul, bombarding the city with hailstones the size of golf balls and submerging much of the city in knee-deep water. 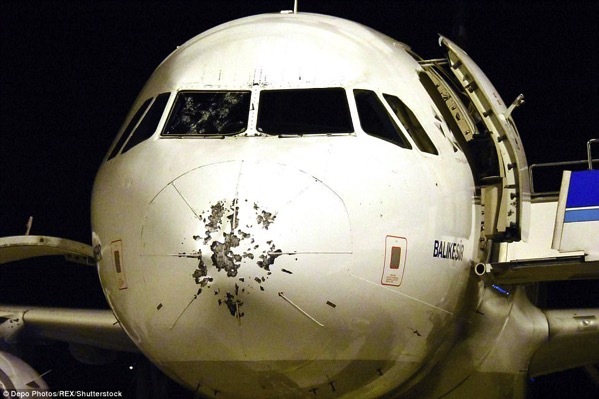 he unforgiving winds, rain and hail appear to have worn away the paint on the Turkish Airline jet’s nose, with cracks visible on the pilots’ window. he plane was forced to make an emergency landing in the Aegean city of Canakkale, around 170 miles flight from Istanbul which endured the worst of the freak storm. Portugal’s Civil Protection Agency says firefighters have brought under control a major 5-day-old wildfire that blackened a wide area of pine and eucalyptus forest. The blaze at Serta, about 200 kilometers (125 miles) northeast of Lisbon, is believed to have charred more than 25,000 hectares of woodland. Other fires broke out Thursday, however, amid continuing hot and windy weather. The Weather Institute says more than 70 percent of Portugal is experiencing severe drought conditions. The Civil Protection Agency reports it has deployed more than 1,100 firefighters and 23 water-dropping aircraft to 13 blazes. Ten villages had already been evacuated after fires broke out on Sunday. By about midnight last night the fires had reached Macao, a town with a population of 2,000. Shanghai registered on July 21 its hottest day since records began in 1872 as a stubborn heat wave baked much of China. The new record of 40.9 degrees Celsius (106 F) broke the previous record of 40.8 set in 2013. Chinese meteorologists say Shanghai is getting hotter, with eight of the 12 highest temperatures over the past century occurring during the past five years. Shanghai’s weather bureau blamed the heat on a stubborn subtropical high and southwesterly winds that are predicted to last until early August. That’s when the typhoon season typically arrives in eastern China. Even though it’s still unsafe for people to live on Bikini Atoll, marine life is thriving 60 years after a series of 23 atomic blasts left it saturated with radiation. Scientists from Stanford University say coconut crabs, coral and other species that have managed to re-emerge on Bikini show barely any genetic differences from those living in uncontaminated parts of the Pacific. Lead researcher Stephen Palumbi believes that at least the coral have mechanisms to protect their genetic information from radiation. Squid and anchovies, more commonly eaten by Britons holidaying abroad, are being drawn into UK waters in large numbers by climate change, according to major new report that suggests the nation’s long-lost bluefin tuna is also returning. However, global warming is harming sea birds, such as puffins, fulmars, terns and razorbills, as the fish they rely on are driven north or deeper as waters warm. The analysis of the impact of climate on the UK’s seas, which draws on the work of 400 scientists, found a steady rise in water temperature. It also found a clear rising trend in sea level, leading to much more frequent extreme high water events. Improved defences and forecasting have prevented an increase in coastal floods, but the report warns that sea level rise around the UK is likely to accelerate. 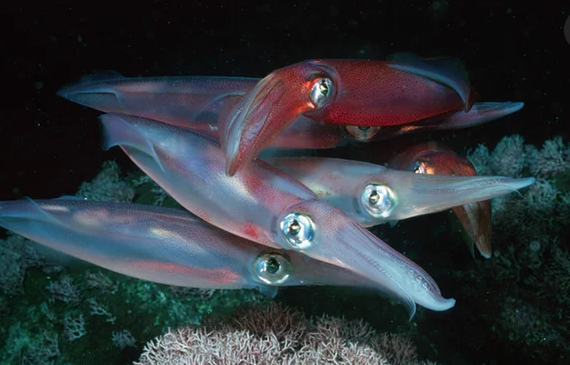 Squid were seen in the North Sea only occasionally in the past but have increased “dramatically”, according to the report, with thousands of tonnes now caught each year and mostly exported. Anchovies have followed the same path northwards. “You now have an anchovy fishery, which is clearly linked to climate change – that is what the science is showing,” said Frost. The anchovies come from the Bay of Biscay, where there is a large Spanish and French fishery. Bluefin tuna were common around the UK before the second world war, with the giant fish a popular target for “big game” fishermen. The decimation in later decades of the mackerel and herring that tuna eat then saw the giant fish disappear. But shifting mackerel and herring populations and warming waters have seen the tuna return.